In just a few hours, people across the U.S. will be settling in for a day of food, family and football as they celebrate Thanksgiving. As the day of gluttony and gratitude comes closer, people have been turning to Google to plan the big meal, get cooking tips and more. 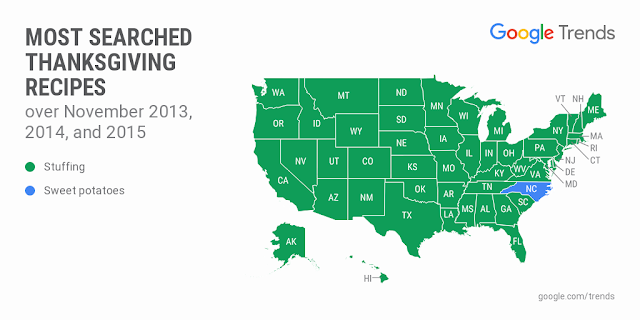 Here's a look at some of the top Turkey Day searches—for more, see Google Trends. In the days leading up to Thanksgiving, people turn to Google to learn more about the origins of the holiday and its traditions, both new and old. Top questions include "Why did the pilgrims celebrate the first Thanksgiving?" and "What president made Thanksgiving a national holiday?" Even amongst regional variations, family eccentricities or that ambitious new recipe you clipped from a food magazine, there's one dish that takes the casserole on Thanksgiving Day. Stuffing is the top searched Thanksgiving recipe in 49 out of 50 states, with only North Carolina standing up proud for sweet potatoes. Our take: Why not have both? Even for people whose usual meal prep consists of shuffling through take-out menus, Thanksgiving is a time to roll up your sleeves and get to work in the kitchen. That—and the fact that a 20-lb poultry dish is a little harder to put on the table than, say, the ol' blue box of mac and cheese—means it's also a time when many turn to Google to brush up on some cooking tips. In the weeks leading up to Thanksgiving, you're asking all kinds of questions, from simple queries like "how to cook spaghetti squash" and "how to boil eggs" to advanced topics like "what can I make ahead for thanksgiving?" and the very crucial, very daunting "How do you make turkey gravy?" The top Thanksgiving recipe question, however, is focused on the main dish: "How to cook a turkey?" Related questions include "how much turkey do you cook per person?" (Answer: there's math involved but the most important part is making enough for sandwiches for multiple days after), followed quickly by "How long to cook a turkey?" (answer: more math). And though roasting is still the top trending technique method for cooking the big bird, enterprising (or efficiency-oriented) chefs across the U.S. are also searching for tips on how to smoke and deep-fry their turkeys. Proof that there's more than one way to cook a turkey. Whether you'll be slicing into pumpkin or pecan pie, eating your turkey smoked, turduckened or made of tofu, serving up fresh cranberry sauce or popping open a can—we hope you have a happy Thanksgiving!